Sharks are my second favourite sea creatures (First are sting and manta rays). If you ever had the chance to swim or dive with sharks (not from a cage or aquarium), you will notice that they are very elusive, calm, and peaceful when in their natural habitat. These 2 photos above are a perfect example of how sharks are pretty much happy to go their own way and leave you alone. If anything, it was me who was very annoying, following them around. 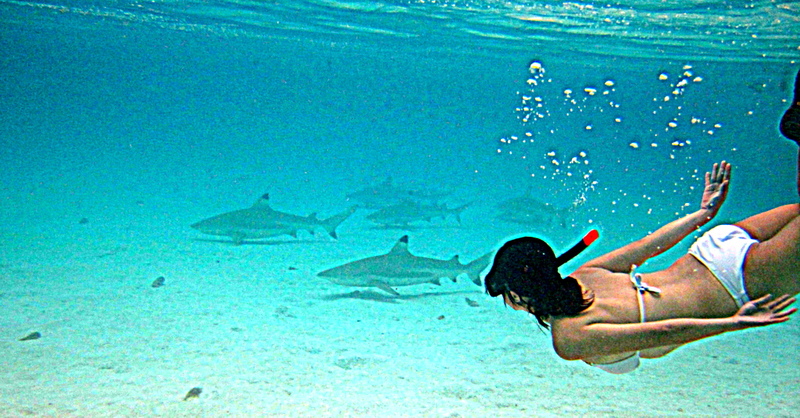 I was fortunate that my very first open water swim with sharks in Bora Bora was a success. No accidents or mishaps. (Not that I was expecting any). It was much more satisfying than my failed attempt at swimming with whale sharks in Mexico. It wasn’t enough though, I wanted more! So we went diving in Tapu, a dive site in Bora Bora known for sharks. The grey nurse sharks are pretty amazing too. Bigger, more turbo packed and more active than the black tip reef sharks. So this Shark Week, I hope we fill ourselves with more knowledge about these graceful creatures. The more we know, the less we fear. Every once in a while, a female shark can reproduce without any male contact. This is known as parthenogenesis. Wasps and bees are more dangerous than sharks.Every year, 100 people die from wasps/bee stings, yet millions of people go swimming and sharks kill less than 10 humans a year. Do you love or fear sharks? I love sharks! I went shark diving while on my honeymoon and it was really incredible. Though I wouldn’t say I am really afraid of sharks the way most people are, it was still a little intimating jumping in the water, waiting for the rest of the group and looking down to just see the black silhouettes swimming around down there. Still though, like you said, they really don’t bother you at all! Wow, that’s amazing. Great photos and videos too! I’ve been swimming with sharks in Hawaii but behind the safety of a cage.. would love to do this!